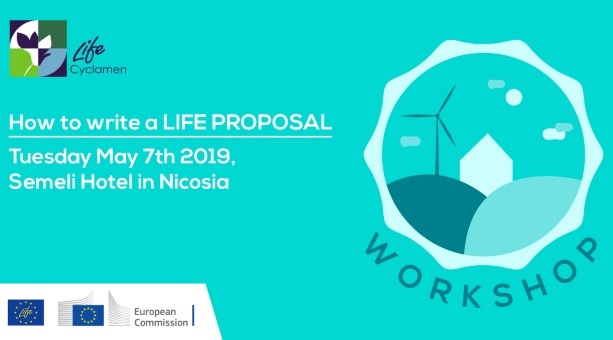 The LIFE Cyclamen team is organising a Workshop on “How-to-write a LIFE Proposal”, on Tuesday May 7th 2019, at Semeli Hotel in Nicosia. The purpose of this workshop is to explain how the LIFE Programme works, starting from the very beginning with the Call of Proposals until the submission of Proposals and their assessment. In addition, it aims to provide guidance to participants through the experience of the National Contact Point (NCP). You can find more information on the content of the Workshop by viewing the Agenda: Workshop How-to-write a LIFE Proposal 2019. To note, that our workshop will be in Greek. This Workshop is part of a series of Workshops organised under the LIFE Cyclamen Project for the informing of current and possible beneficiaries of the LIFE Programme. It is designed for individuals with previous LIFE experience and / or basic knowledge around the LIFE Programme. Book your seat until April 26th 2019 by filling in this form.